Christian seasons and festivals are important in the rhythm of children's lives. They reflect the stories of the Christian faith and enable children to mark time in the year; both in celebration and preparation. Christmas, Holy Week, Easter and Pentecost are the key points of the year, but the church also focuses on Advent and Lent - times of preparation - and festivals such as Candlemas and All Saints also have their place. Children are enabled to experience the joys and sorrows of the Christian story, and make connections with their own lives. Advent: (purple) A time of preparation for Christmas. 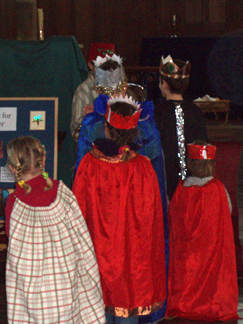 Christingle services are often held during Advent. Lent: (purple) Six weeks of preparation for Jesus' passion, death and resurrection that starts on Ash Wednesday. See also Tree of life and A seasonal journey. On the fourth Sunday of Lent Mothering Sunday is celebrated. (green) The Sundays after Trinity and before Advent(and a few Sundays between Epiphany and Lent). Harvest and Bible Sunday fall within this time.